Snow Diamond Select Lot #33! 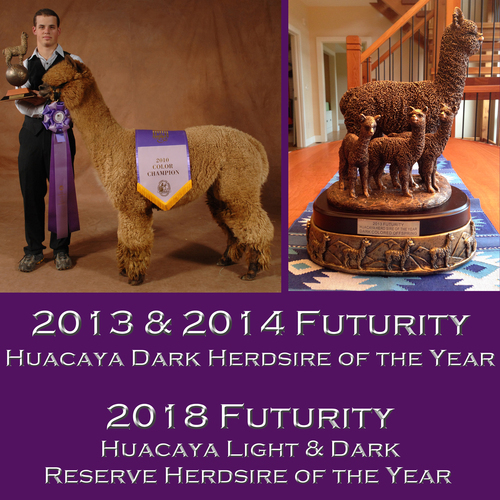 3x Champ, 2013 & 2014 Dark Futurity HotY! 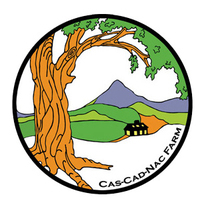 Was she a fading fawn or a light rose grey? 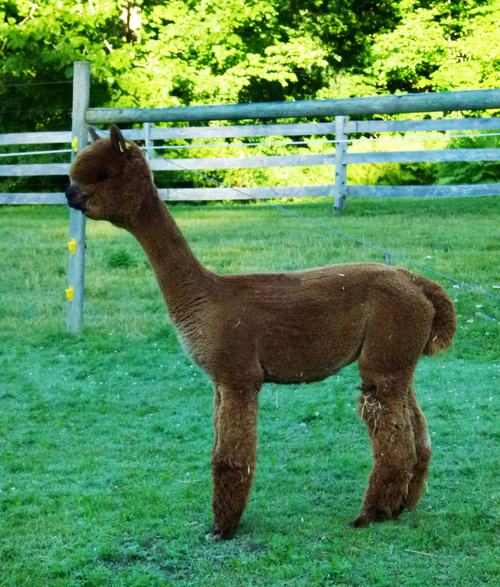 The truth was then (given her fleece quality) and now (given her crias' qualities) that we didn't/don't really care. 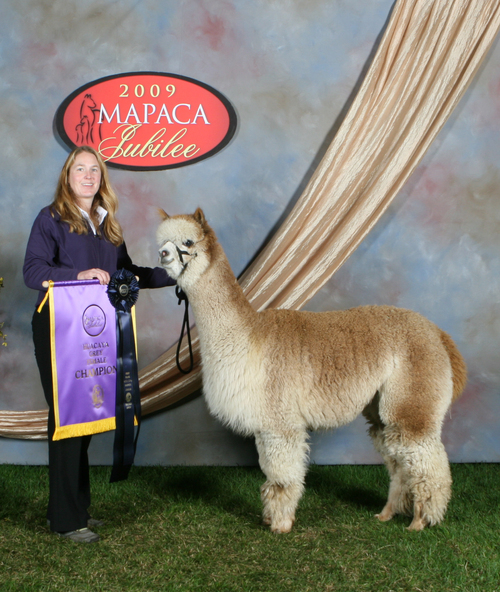 Marguerite is arguably the most impactful daughter of CCNF Royal Ring of Fire in our breeding program. 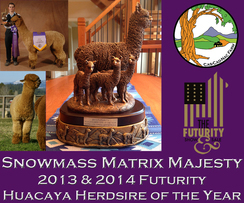 CCNF Dominique is the younger full sister of our Margaux, sired by Snowmass Matrix Majesty (2018 Futurity Reserve Herdsire of the Year for both Light *AND* Dark offspring) but just as importantly, out of arguably the best Ring of Fire daughter in our program: CCNF Marguerite (who just gave birth to their full sister, version 3.0, CCNF Geraldine). It’s a line we believe in and with a track record of producing next-gen level stuff. 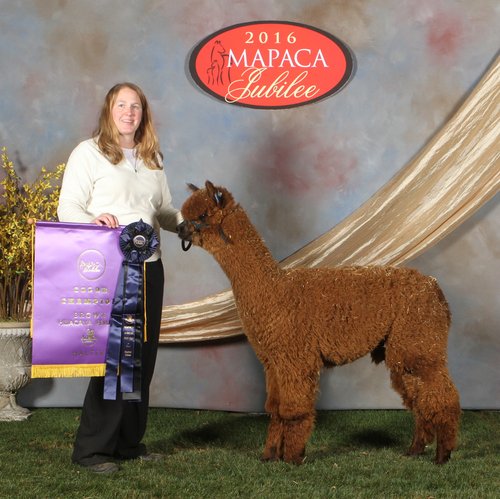 When we bred her older sister Margaux to Elixir, she produced produced our multiple Champion and Judges’ Choice winner, CCNF Nikita, who has now joined her dam and and granddam in our breeding program. 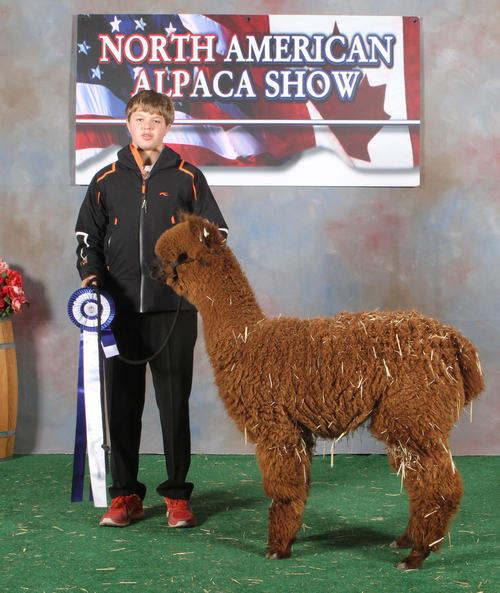 With that record in mind, their was never any doubt that we would offer Dominique for sale at the Snow Diamond Select with a future breeding to either Elixir himself OR his 2018 Futurity Champion & Judges’ Choice winning son, CCNF Sovereign-Legacy!